Demand is high and the region’s attributes are attractive. The state of the development in Northwest and Northern Indiana has, of course, had its peaks and valleys within the last decade. Remember 2009? Most want to forget it. We took the time to speak with leading commercial realtors who not only identified the latest developments but also told of the possibilities for business expansion from the state line bordering Illinois to the borders of Michigan and Ohio. From Lake County to Elkhart County, the rail, shipping and airway advantages strengthen the argument for business expansion in Indiana. “Northern Indiana is a great place to drive distribution and larger manufacturing; great transportation and the telecommunications infrastructure makes it a phenomenal place to draw a business,” says Bradley Toothaker, president and CEO of the Bradley Company of South Bend. “Industrial real estate, warehouse-types, are coming in from across the border.” Great Lakes Capital at Portage Prairie, a 450-acre park, is considered prime location for distribution with easy access to I-80/90 and five miles from the South Bend International airport. Currently home to Hubbell/Raco, Global Parts Network, FedEx and Chase Plastics, the 210,000-plus-square-foot modern cross dock warehouse and distribution center is being built. Michael Siwietz, associate broker for McColly Bennett Commercial, believes that communities across Northwest and Northeast Indiana have a major commonality. “Communities have a major commonality being close to the expressway corridor,” says Siwietz. He notes bordering Cook County in Illinois has either purchasing or leasing opportunities. “From a short term basis standpoint, we have experience, and we have been doing site evaluations from businesses in Cook County who would like to bring some of their workforce with them, and they want to stay along the major corridor,” says Siwietz, pointing out businesses have opportunities in East Chicago and Hammond. However, Siwietz notes the current structures providing the opportunity have to be repurposed, and repurposing a building could be a substantial cost. “The challenge is the limited amount of locations,” says Siwietz. Scott Duerkop, vice president industrial services at Jones Lang LaSalle, represents developer Becknell Industrial for NorthWind Crossings along the I-65 corridor. Becknell Industrial’s 200-plus-acre master planned business park is located just 25 miles from Chicago in Hobart. With access to the I-80 corridor, NorthWind Crossings offers build-to-suit projects ranging from 20,000-square-feet to over 800,000 square-feet. To date, six sites have been built. 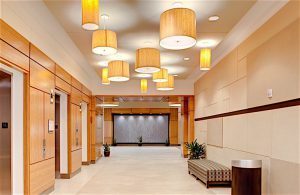 “We can deliver anything from a 40,000-square-foot building to nearly an 800,000-square-foot building,” says Duerkop. He notes the number of requests for proposals (RFPs) from companies who operate in Northwest Indiana and are looking to expand. “Others are coming from out of state–household names we know–and those types of users are looking for distribution space,” says Duerkop. MEDICAL SPACE IN MISHAWAKA Demand for various types of commercial space is on the rise across St. Joseph and Elkhart counties. Duerkop notes the close relationship with the city of Hobart. “We consider them a partner and they have been excellent partners for us. You have to look back and see what this part was 15 years ago,” says Duerkop. “It was vacant land that sat along 1-65. If you look at the city now, 15 years later, it makes them a strong employer,” Duerkop says, noting the ability the city of Hobart has to attract employment, bringing more business to the city itself. Duerkop believes the multi-tenant building is poised to have an immediate positive impact on the business environment in Northwest Indiana as it can be occupied by users immediately, bypassing the otherwise lengthy design and development process associated with a custom “build-to-suit” scenario. Further across in St. Joseph and Elkhart counties, Ed Bradley, senior vice president and principal for Newmark Grubb Cressey & Everett, notes the obvious demand in today’s climate. “The demand for space has increased and continues to increase at a moderate pace. It has taken inventory off the market–generally speaking,” says Bradley. “From an industrial perspective, the inventory of available space has shrunken. I think it has all of the supply and vendors related to that area of St. Joe, Elkhart County seeing more activity and increased market strength.” Bradley notes the number of changes occurring in South Bend including the urban development. 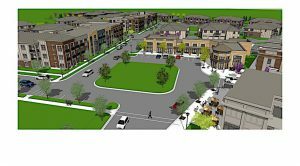 TOWN CENTER CONCEPT GrandView Flats and Townhomes in Granger brings urban amenities and conveniences to a suburban setting. “One of the things not seen in a long time, is the introduction in urban environment. There are four projects currently in the downtown area. These can accommodate as small as 12 units, as large as 60 units, maybe 175 units we’ll see developed by four developers,” says Bradley. “It’s been 25 years since we’ve seen this.” In this optimistic climate, Bradley also notes that municipal and local cooperation is at an all-time high. The cooperation equals more money invested into, not only a city and county, but also the state as well. Estimates of investments for the Notre Dame Campus Crossroads project projected near 750 million. “That is just the impact for the construction industry alone,” says Bradley. “There is a whole submarket, even residential at some point.” But what are developers to do where space is limited? Are there opportunities? “I’d like to see some sort of action addressing buildings that are obsolete. I think progress is being made and we need to continue that,” says Duerkop. “What you see driving down the expressway looks like a vacant piece of land.” Duerkop notes that there is usually one or more issues that could include an inactive rail line, rail easement, or even a wetlands issue. “It can be more economical to build than it is to renovate. Many times, because what the building was originally designed for, other businesses are looking for amenities-wise,” says Duerkop noting that docks or truck levels may not exist for those buildings in existence. He also believes there may need to be a bigger effort to address some of the sites affecting environmental issues with remediation. “There are sites that exist the short distance from those areas to Chicago, and this is going to become more important with time. The urgency may push some effort to deliver clean sites,” says Duerkop. Says Toothaker, “There is still recovery necessary in the market and there is still demand, and I believe we can see the demand in the industrial market will continue. Our biggest hindrance to growth is supply. My best industrial brokers are challenged because they cannot provide the supply. It doesn’t exist. Creation of new space, new developments, the challenge when things like this happen–you need a little more confidence to come back in the market”. David A. Lasser, SIOR/CCIM, local commercial real estate broker for Commercial In-Sites LLC, and chairman of the board of the Lake County Economic Alliance, believes the many communities in Lake County are poised for development. The main future opportunity is in new construction, since the market has tightened up significantly in availability. Lasser believes the resurgence is due in large part to the need for quality business parks. Lasser notes that many of these business parks may not currently have the sites available, but this does not mean there is not a future for many counties. “Communities most poised are Chesterton, Valparaiso, Crown Point and Merrillville. Most of the focus for distribution is industrial. Nothing is really vacant, and it is mostly retail. But as Lasser notes, this does not mean there are not any opportunities. Van Drunen Farms relocated and expanded operations into Indiana from Illinois. “Van Drunen was going to remodel. Then they decided to tear down and rebuild,” says Lasser. Hoist Liftruck, a manufacturer of heavy-duty forklifts, plans to move from Illinois to East Chicago, to an existing site. “Hoist is moving to a 500,000-square-foot building built in the 1900s. It is going to become a state of the art facility,” says Lasser.